Join actors, musicians and Dr Matthew Green on an immersive gin tour of London, exploring the meteoric rise of the juniper berry from Dutch decadence to agent of mass oblivion, meeting a cast of ruined characters straight out of Hogarth along the way and visiting a wealth of spirituous haunts, from the lowliest Georgian gin shack to the most opulent Victorian gin palace. Includes a G & T in the Princess Louise, a stunning Victorian gin palace, a gin-based cocktail at the Holborn Dining Room, London’s biggest modern gin bar, and the opportunity to drink from a wheelbarrow of gin, Georgian style, in squalid St Giles’s. Dr Matthew Green is the author of the critically acclaimed book London: A Travel Guide Through Time (Penguin), described by the Londonist as ‘easily the most engaging social history of London for a decade’. Beginning outside the Church of St Giles-in-the-Fields, we will begin by exploring the dark, twisting back-alleys and soot-smeared terraces of St Giles, the setting for Hogarth’s Gin Lane, where an air of desolation and despair still lingers from the 18th century. In Phoenix Garden, one of the last remaining bomb sites in central London, we will drink gin Georgian style – from a wheelbarrow (with a straw). From there, we will move onto the site of Moll King’s gin shack in Covent Garden piazza, one of the most iniquitous and dangerous places in the whole of 18th-century London, before taking a more wholesome trip through Lincoln’s Inn Fields, London’s biggest square, dating from 1648, through to London’s biggest gin bar in Holborn. 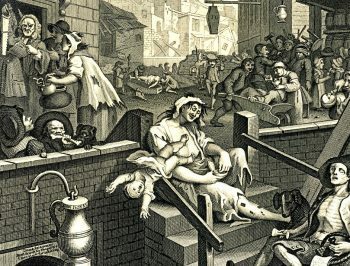 Along the way, you will meet some of Hogarth’s characters from Gin Lane — Mr Gripe the pawnbroker, Mr Kilman the heartless distiller, the ruined mother who breezily lets her infant fall to its doom, a gin pamphleteer, and even William Hogarth himself, the arch-enemy of gin. 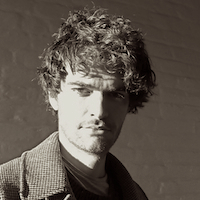 The performances will be woven into Dr Green’s vivid stories of what life was like in Georgian and Victorian London, particularly for the labouring masses, and heartbreaking tales the human cost of Mother’s Ruin, something akin to the crack epidemic that afflicted American cities in the 1980s. You will leave the tour with an insight into the remarkable impact of gin and, by exploring St Giles’s, Covent Garden and Holborn, a sharp sense of how 17th and 18th-century London evolved into “a great and monstrous thing” – the biggest city in Europe. It’s also a great opportunity to warm your spirits by drinking lots of gin in the depths of winter.